← ArtScroll’s BIG Talmud and Mishnah Sale: 30% Off! What comes to mind when you hear the word Purim? Imaginative costumes? Gorgeous mishloach manos? The wondrous story retold in the Megillah? Purim seudahs filled with great food and lively singing? Halachah? That’s right. With all the cacophony and excitement of this most fun of holidays, Purim, like every other chag, is governed by halachah – many of which are often overlooked in the Purim frenzy. 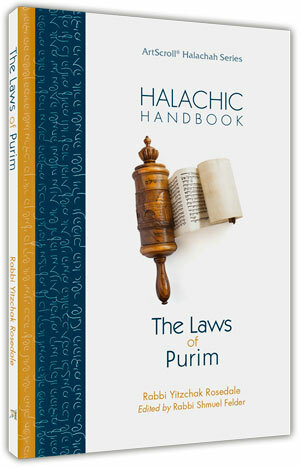 That’s where The Halachic Handbook: The Laws of Purim, comes in. Topics covered in The Halachic Handbook include the laws of Parashas Zachor, Taanis Esther, mach’tzis hashekel, Megillah reading, matanos l’evyonim, mishloach manos, and many more. Also included are thought provoking essays on the holiday. The Halachic Handbook includes ArtScroll’s Birchas HaMazon, and its compact size makes it a perfect gift for yeshivah dinners, weddings, and other events. And it makes a welcome addition to mishloach manos baskets! Purim. Yes, it’s fun. But The Halachic Handbook will help us take it to a whole new – and vital – level. Click here for exclusive online savings on The Halachic Handbook. I have just received this little sefer. I like the compact format and the concise but comprehensive content. It is affordably priced too. I’m really looking forward to the future volumes in this series.